Corn flour mixture - 1 tablespoon of corn flour dissolved in 1/2 cup water. Wash clean and wipe the mushrooms. Then slice them. Mix the all purpose flour, corn flour, chilli powder and salt along with required water to prepare the batter. Make sure the batter is neither too thick nor too thin. To this add the sliced mushrooms, mix well such that the mushroom is coated well with the batter. 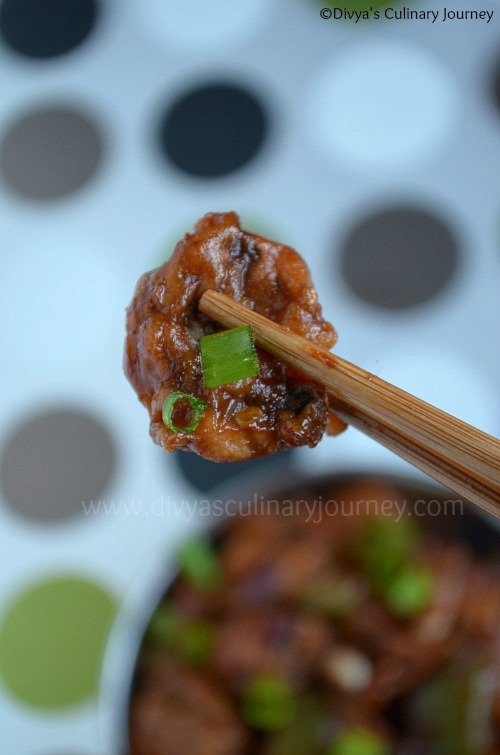 Heat the oil and deep fry these mushrooms in medium heat till they are golden brown. Fry them in batches and drain excess oil in paper towel. Then heat oil, add onion, bell pepper and bottom white part of the spring onions, saute for 2 - 3 minutes. Then add Ginger and garlic and saute for another 2 minutes. Now add required tomato ketchup, soya sauce, chilli sauce and corn flour mixture and let it cook for 2 minutes. Now toss the mushroom fritters in the sauce. Mix well and cook for a minute or two and turn off the heat. Garnish with chopped spring onions and serve it warm. If you prefer more spicy you can add 1 or 2 green chillies. Adjust chilli powder to your personal preference. Add salt in moderation, keeping in mind that soya sauce has salt too otherwise it will become super salty. If salt is less can be adjusted later. You can prepare the mushroom fritters ahead of time and just before serving, can cook the rest and serve it. It tastes the best when served immediately. If interested do check out the other Mushroom Recipes I have posted. 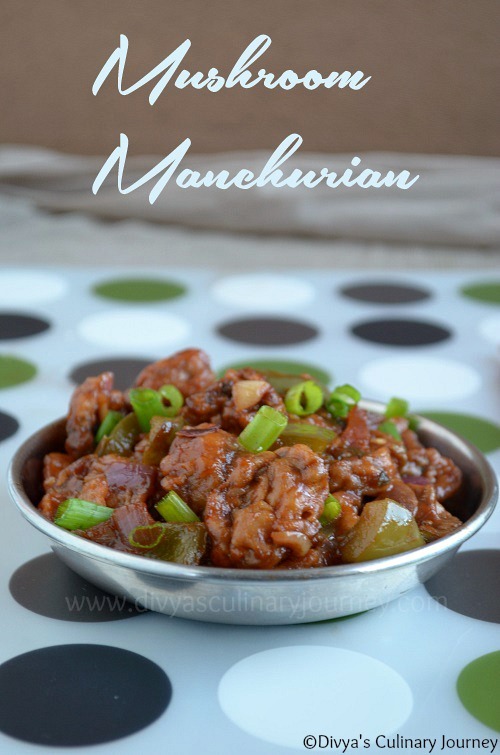 Delicious mushroom manchurian love this try to make it for this weekend. Loved the base completely... too good . 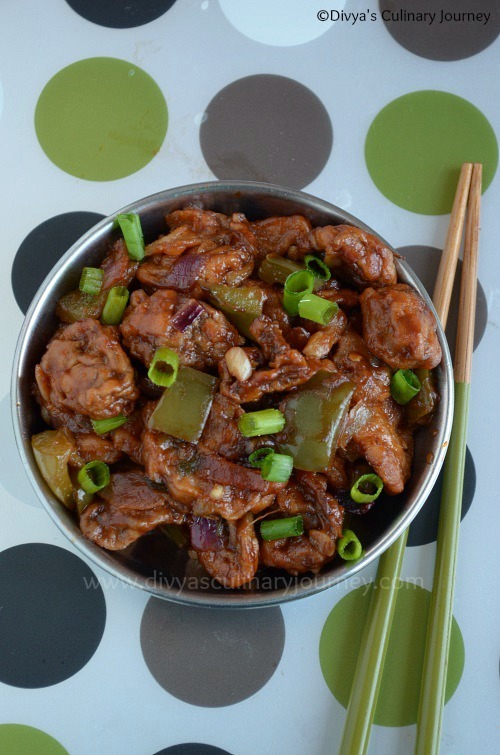 Mushroom manchurian looks so yummy Divya! Well explained recipe with tempting clicks, last click is awesome. Yummy and inviting appetizer.. Beautiful clicks..